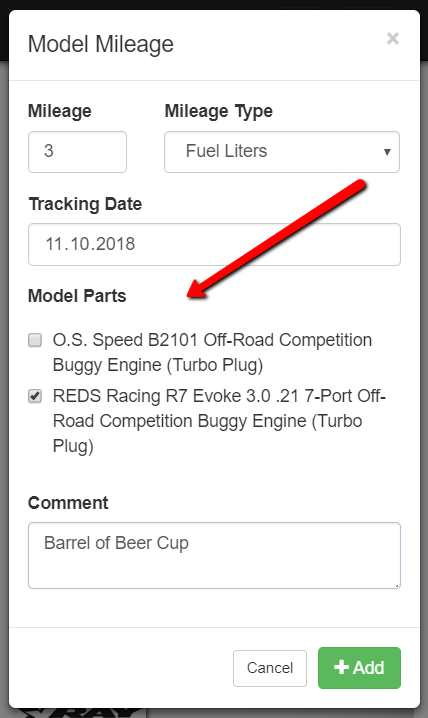 From the point we deployed a feature that helps keep track of a model mileage in RCGarage we have received a number of requests and ideas on how to improve this feature and so we did some changes and updates. It is possible to keep track of a particular parts installed on your RC car, RC boat, RC plane or whatever you have in your RCGarage. For example you can track mileage for a different engine installed one after another your RC Nitro Car so you will track engine's mileage independed from each other. You can track mileage for a particular electroncs, batteries, ball bearings, etc. This feature is now available for all RCGarage users.